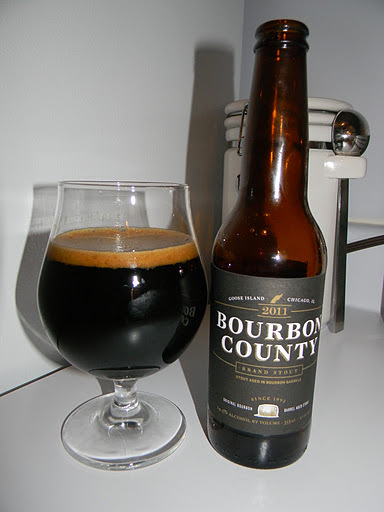 Review of Goose Island Bourbon County Stout 2011 | Beer Apprentice - Craft Beer News, Reviews, Interviews and Info. Hello guys. For today’s craft beer review I have a very special beverage to share with you. It’s the 2011 version of the Goose Island Bourbon County Stout produced by the Goose Island Brewery located in Chicago, Illinois. I’m ashamed to say that I’ve never had this brew before, so I’m really excited about getting this thing in a glass and giving it a test drive. First, let’s see if we can find some information about this product on the website, gooseisland.com. This brew has a massive 14.5% ABV and it comes in a 12 oz. bottle. The beer poured extremely black!!! Absolutely no highlights showing at all. It had one of the darkest brown heads that I’ve ever seen on a beer too. It was none too large, but it was tight, compact, smooth and creamy. As to be expected with a beer this “big”, the retention time was minimal as was the lacing. When titled from side to side a ton of thick, clear alcohol lacing was left clinging to the glass. The nose began with a heavy waft of Bourbon Whiskey. It was very woody and oaky with hints of sweet vanilla and dark chocolate. Light notes of espresso and sugary molasses intermingled with roasted malts and tobacco. Wow!!! The aroma was very deep and complex, but the Bourbon Whiskey was the star player in the aroma that’s for sure. The taste brought forth even more of the Bourbon Whiskey. It was rich and bold with implications of bittersweet dark chocolate, vanilla and espresso. It was charred and heavily roasted, but not smokey. As the brew progressed to room temperature it began to conjure up notes of deep oak, leather, dried tobacco and syrupy molasses. The alcohol was very prominent, however I found it to be most enjoyable and not nearly as distracting as I thought it might be. It tasted very, very good in my opinion. The mouthfeel was medium to full bodied. It was chewy and dry with a tremendous amount of alcohol burn and warmth. After the brew warmed it started to really mellow and become very smooth and comforting. The palate was completely inundated with flavor after each sip. Wow!!! This beer was outstanding. It was very bold, striking and gargantuan in both the aroma and the flavor. Now, this brew is a sipper, so the ease of drinkability was not very high. As a matter of fact it required a great deal of time to finish one bottle. With that being said, if you have the time to sit and let this beer flourish, I think you will find it most enjoyable on a cool Winters night. I know I did. So, if you have access to the Goose Island Bourbon County Stout and you enjoy big Imperial Stouts with a Bourbon kick, be sure to pick up a bottle and give it a go. I currently have a few more bottles of this, so I want to save a couple and see how they develop in years to come. I bet they only get better. Have you guys tried the Goose Island Bourbon County Stout yet? If so, did you like it? What vintage did you have? Be sure to leave a comment if you so wish.